In its splendid location…the Federal Hall National Memorial is one of the few truly imposing temple-form structures in New York City. The elegance of its overall proportions and the simplicity and power of its Greek Doric architecture make it one of our finest monuments. America’s original capitol was demolished in 1812 and in its stead rose an architectural masterpiece. Erected in 1842, this was the city’s first purpose built U.S. Custom House for the bustling Port of New York. The exterior was modeled on the Greek Parthenon and its interior rotunda on the Roman Pantheon. One of New York City’s first landmarks, the building is noted as an unusual example of the Greek Revival style, due to the façade’s dual monumental Doric columned porticos. The interior rotunda, featuring a towering saucer dome and grand Corinthian columns showcases the most advanced type of stone construction of its period. The original design was conceived by architects Alexander Davis and Ithiel Town, with further modifications by the sculptor John Frazee and architect Samuel Thompson. 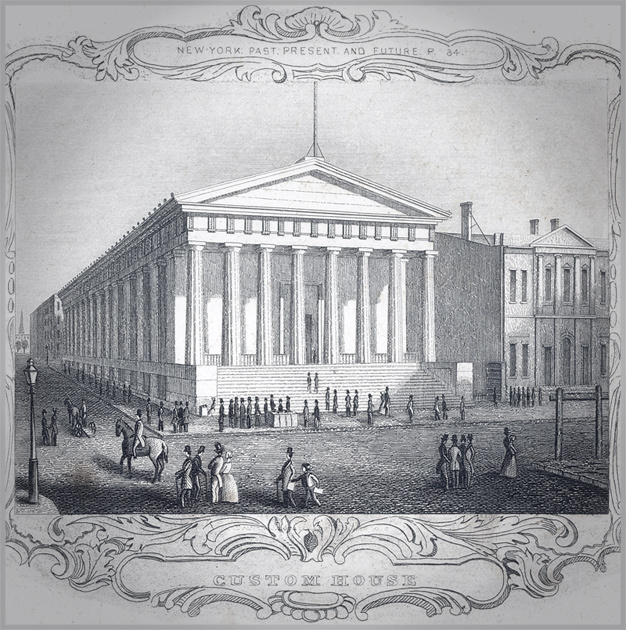 The building served as a Custom House from 1842 to 1862, after which it became the largest of six U.S. Sub-Treasuries. Massive fortified steel and concrete vaults were installed in the main rotunda and in the basement during the late 1800s. Help found a living forum of democracy at America’s birthplace. DONATE NOW! Main entrance: 26 Wall Street. Wheelchair accessible entrance: 15 Pine Street. Get detailed visitor information.